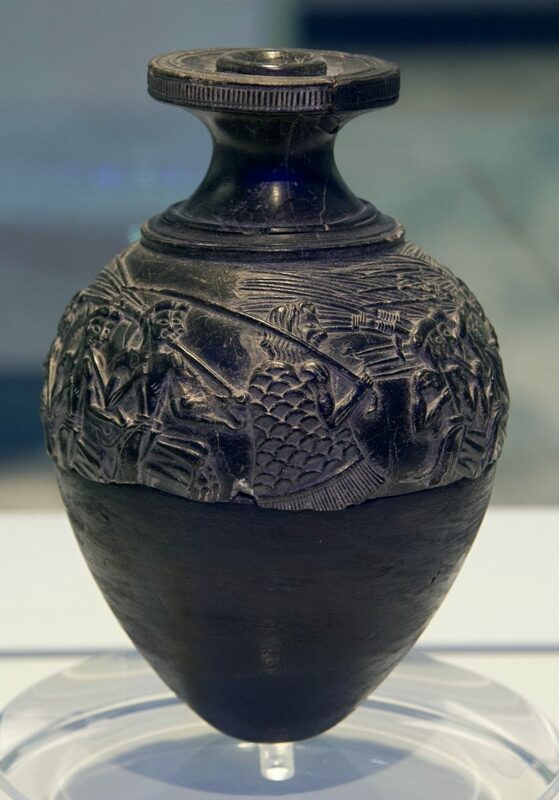 As the name of this vessel indicates, it is generally thought that its decoration refers to harvesting. Found at Hagia Triada, an elite site associated with Minoan palaces and dating to the Neopalatial period, (1600-1450 B.C.E.) 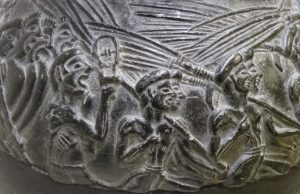 the Harvester Vase displays a detailed and fascinating scene of men marching and singing in what appears to be a harvest celebration. Although it is not a grand artistic monument, this small vessel (about 4.5 inches in diameter), communicates a grace and vitality typical of Aegean Bronze Age art. 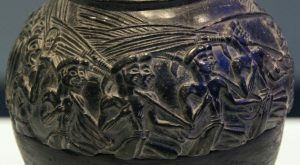 The Harvester Vase is actually not a vase but rather a rhyton, a ritual vessel use for pouring liquids. It has a hole at the top and would have had a hole at the bottom before it was damaged. It is made of black steatite and is shaped to look like a similar vessel made of an even more valuable material: an ostrich egg shell. 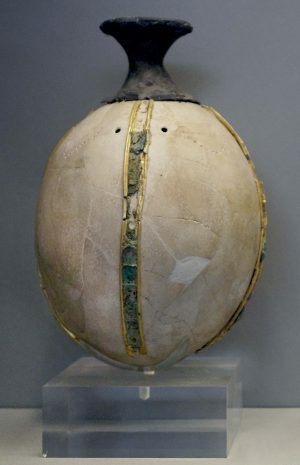 Ostrich egg rhyta were some of the most luxurious and exotic ritual goods in the Aegean Bronze Age. This type of object was made by drilling holes at either end of an ostrich egg (imported from Egypt), drawing out the contents, and affixing a decorative rim on the top and at the bottom. However, what the Harvester Vase lacks in imported luxury, it makes up for in sheer sculptural power. 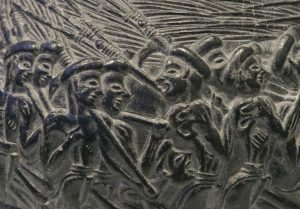 The miniature scene, carved in relief, illustrates some twenty-seven men in a procession. Most of these men are depicted in pairs, legs stepping high and right arms bent at the elbow, hands held close to the chest, and wearing identical costumes: loincloths, flat caps, carrying bags or pads on the left thigh, and on the left shoulder, a pole with a short curved blade and a three pronged fork. These men are all young, slim, and muscular, with angular faces turned up to the sky. Their paired, lock-step procession evokes marching or rhythmic movement. There is one exception to this rhythm: near the back of the group, one man turns to look behind him, perhaps because, it would appear, another has fallen just at his back. This marching group is led by an apparently older man, wearing long shaggy hair and a fringed robe with a scallop pattern (above). He carries a long staff, crooked at the bottom and tapering at the top. 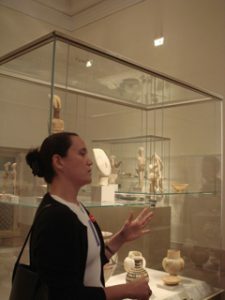 In the middle of the group of men behind him is another single figure, a man who looks perhaps not as young and lean as those in the group, who is shaking a sistrum (a musical instrument used in religious rituals). These were common in ancient Egypt as well as in ancient Greece and Rome; examples have been found on Bronze Age Crete as well. This man appears to be shouting or singing with his mouth wide open and he is followed close behind by a rank of four men who also have wide open mouths and wear cloaks around their shoulders. 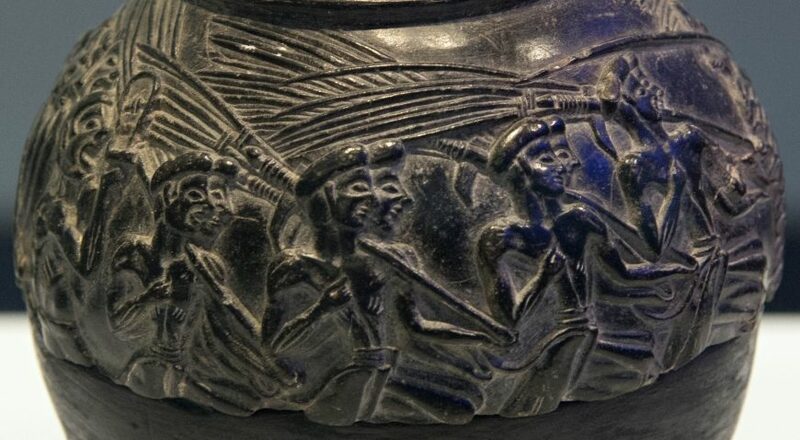 As the name of this vessel indicates, it is generally thought that its decoration refers to harvesting, the key evidence being the long implement each of the younger men is carrying over his shoulder. What is not clear is exactly what the implement is. If it is a winnowing fork, these men are harvesting, collecting mature cereal crops; they will use the fork to separate the grain from its husk. If the implement is a hoe, festooned with branches, then the men are off to plant seeds—perhaps to be found in each of the men’s bags. 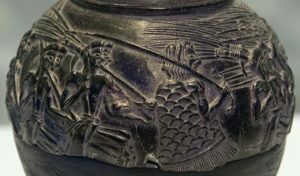 Which it is—harvesting or planting—we may never know, but what is clear is the masculine, communal, and celebratory nature of the activity depicted on this beautiful vessel.